frog - "make that change"... zero carbon homes - zero carbon house, zero carbon houses - eco homes - eco house - eco houses - green homes - green house - green houses - eco-friendly homes - eco-friendly house - eco-friendly houses - prefabricated homes - prefabricated house - prefabricated houses - modular homes - modular house - modular houses, affordable homes - affordable house - affordable houses - detached homes - detached house - detached houses - code 6 - sustainable - eco - green - renewable - frog - frog homes - environment - environmentally friendly - francois the frog - francois. 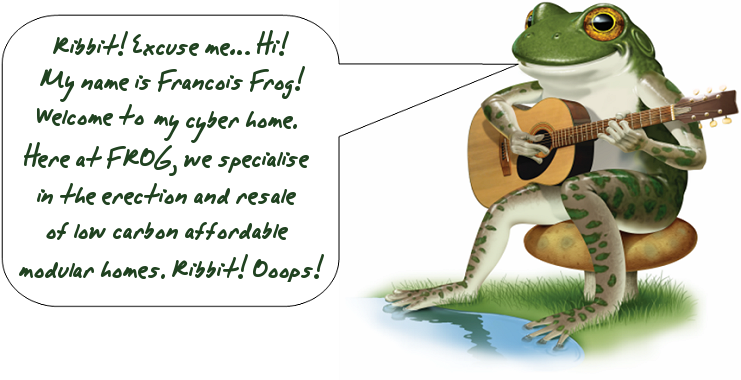 FROG is a builder and reseller of zero carbon (Code for Sustainable Homes Level 6) modular homes. We are not a construction company, manufacturer, nor are we an estate agent. Our objectives are as follows: to acquire a plot of land, acquire the housing materials, build homes, and resell them to members of the general public. FROG is a company that prides itself on providing affordable zero carbon houses that meet the standard of sustainability code level 6. The term "zero carbon" is a definition within "Code for Sustainable Homes (CSH)" set by the Labour government of the UK. Our properties achieve zero carbon (level 6) emission status within Category 1 of the CSH. The housing product within the FROG SPAWN product package expels carbon dioxide, albeit in tiny amounts. With the advent of offsetting technology, on balance, the dwellings offset more carbon dioxide than it expels. Level 6 is by far and away the most eco-friendly and energy efficient standard available today. Copyright © FROG. All rights reserved. Website Design By Lee Prangnell.